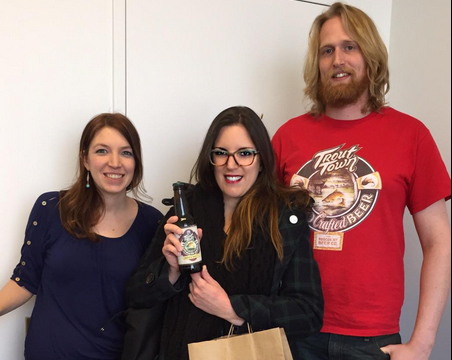 Shannon Feeney, director of marketing (l) and Josh Hughes, brewmaster of Roscoe Beer Co. with Beer Affair’s Cat Wolinski, New York, N.Y. Feb. 22, 2015. NEW YORK—The Roscoe NY Beer Company, known chiefly for its Trout Town brand of craft beers in Roscoe, N.Y., has announced it will expand distribution throughout the states of New York and Connecticut, including the five boroughs of New York City. The recent expansion will occur through Grapes & Greens and Ippolito Distributing. The beers are currently available through Dana Distributers, Dutchess Beer Distributers, Northern Eagle Beverage Company and Dichello Distributers. Previously distributed only in the Roscoe, N.Y. area, the three Trout Town handcrafted beers—Trout Town Brown Ale, Trout Town Rainbow Red Ale and flagship Trout Town American Amber Ale—will now be available in 22 different counties across New York and Connecticut. Roscoe brewmaster, Josh Hughes, told Beer Affair the expansion represents his and the brewery’s desire to increase awareness of the Roscoe, a small fishing town located 120 miles north of New York City. Along with celebrating their expanded distribution, Roscoe Beer Co. will be unveiling a new tasting room and holding a grand opening this Spring. The new tasting room will feature a fish tank (full of trout, Beer Affair confirmed), floor-to-ceiling trees and a 16-foot glass window, all designed to promote the natural components of the area and the beer itself, which is brewed using only natural ingredients, according to the company. As of April 2015, Trout Town beers will be available in: Fairfield, Litchfield, Middlesex and New Haven Counties of Connecticut; and Bronx, Brooklyn, Chenagno, Columbia, Delaware, Dutchess, Greene, Manhattan, Nassau, Orange, Ostego, Queens, Rockland, Staten Island, Suffolk, Sullivan, Ulster and Westchester Counties of New York. For more information, contact Lauren Verini at lauren@adinny.com or 212-693-2150 x311.